Time for Friday’s Fave Five, a rundown of five of my favorite things from the second full week of January. If you’d like to jump into FFF, visit here and read all about it. I like to look at this as blessings from the week. My list is always filled with things that have touched me, spoken to me, and reassured me. Hope they do the same for you! 1. A reassuring word for the mom in me. In my daily Bible reading this week, I came across a passage I’ve read before, but it struck a chord this time. Harassed and helpless – those two words jumped out at me. They describe how I have felt so many times in this mothering journey. Harassed by time demands, by lack of patience, by my and others’ expectations… Helpless in the face of the clock; I want to speed it up or slow it down, preserve this moment or quickly get past it. But “…He had compassion on them.” He sees my moments of helplessness, senses my feelings of harassment. He sees, He cares, He shows compassion. 2. The discovery of a new author. For me, at least, Sibella Giorello is a new author. I read one of her books during December, finished the second this week, and am looking forward to her upcoming release in March. A Christy award winner, she packs a lot of meaning into few words, says so much with so little. And that’s not easy to do! Her fiction is entertaining and full of meaning. Just click on her name above to check out her books. 3. Compassion in the hearts of the young. The earthquake in Haiti has brought so many needs to the surface. My school has some ties to Haiti – after all, in South Florida we are just about an hour away. Some of our students have extended family there and a number of our kids have participated in mission trips to a church and school we’ve “adopted” in Haiti. These kids have seen Haiti firsthand; they remember the children, and they hurt for them. For the last two days, these students have met at noon to pray and are exploring how they can help the country of Haiti. For a word from one who has been there (before this crisis), see this blog. It happens to be written by one of my own boys, and it contains links to organizations that are helping the Haitians through this tragedy. 4. Two lovely blogs. In the craziness that is sometimes the internet, it’s refreshing to find little havens, pockets of peacefulness. I came upon two blogs that fit that description this week: Muthering Heights and A Feast of Light. I’ve run across some great places with wise words and met a lot of new blog friends, but I have to say that when I leave either of these two blogs, I feel like I’ve just taken a nice, deep breath. The combination of sentiment and beauty in both of these blogs just kind of slows me down, and these days, that’s a good thing! Go see. Take a nice, deep breath. 5. Some kind words about my youngest son. Of course, I think he’s great, but you do wonder once in a while how they are when you’re not around – with peers, in different settings. A couple of friends told me this week how wonderful my youngest is, and they see him in settings that I don’t. Every mom needs to hear those good words once in a while. I have a friend who sees nothing but good for my boys, even when I have valid worries. She’s usually a realist, not a Pollyanna, so her faith in my boys really encourages me. I suppose friends like that would be my FFF 5.5. So much to be thankful for! How about your Friday’s Fave Five? I’d love to hear about five things that graced your week in the comments – or visit Living to Tell the Story to get the details. Hope you had a wonderful week and your weekend is filled with smiles! I have bookmarked all your links,,,they look wonderful! Haiti makes me feel so desperate and sad... Motherhood...oh boy! Its always great to hear good things about our kids, especially from their peers. So sorry for those kids who are closer to what is happening in Haiti. That whole situation is heartbreaking. What lovely faves. Thanks for no. 1It's a comfort to me nowadays! Love, love the compassion verse. I need to write it in my journal since I’m focusing on compassion this month. And you made a great connecting point with it to our own lives. I definitely relate to what you're saying. Have a blessed weekend! Oh that first one is wonderful. Thank you so much for sharing your insights. Your blog looks so great! I now I've told you that before, but it does!! Love the redesign. I love your Fave Five - all so great. It's always encouraging to hear good things about our kids, especially from their peers. And compassion in young hearts - so very pure and genuine. that always gives me hope. The encouragement about your boy reminds me of the verse that says I know no greater joy than when my children are walking in the truth. It would be top on my list too. I'm so glad to meet you Laura - we mothers of 4 boys need to stick together :) thanks for dropping by my blog! Thanks for visiting Gold in the Clouds....love your fave five list...especially the part about your littlest boy! GOD IS GOOD! Great to "meet" you as well. Anyone tied to my beloved "homeland" is a friend of mine. I'd love to hear more about that connection when time allows. Of course, I'm partial to everything Wilmore, but it's always refreshing to hear an "outsider's" perspective. Blessings to you this weekend. Do hope we can chat more later. And the verse that you quote. About how He saw the people and He had compassion for them. That's my prayer for Haiti. I feel overwhelmed by their situation. I'm going to check out your FFF. And did I hear via the bloggy grapevine that you have a book that's about to be released? I enjoyed this post, and you insight into the verse you shared! Thank you for visiting and praying for my friend. 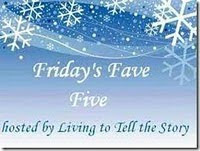 I enjoyed your son's blog and your Friday Fave Five. Am always glad when a new blog friend drops by and leaves a comment. I'm sure you know how special that makes one feel. I went to your son Andrew's post on the Haiti earthquake before coming back here to comment. He shares his heart beautifully and I'm so grateful I had a chance to read it. Your FFF list touches me too... yes, as moms we all want to hear a good word about our children. I love Andrea's Feast of Light blog, too. Looking forward to visiting again. How nice to meet you through Friday's Five Favs (even though it's taken me all weekend to get here). As a (happily) retired teacher, I'm fully aware how challenging motherhood can be. I've added your blog to my reader and look forward to dropping by as time permits. Wishing you a Sunday of renewal and a wonderful week ahead. Thanks for stopping by my blog. I'm always looking for a new author. I'll check out Sibella Giorello. Love the encouraging word you recieved in your reading. It is always wonderful to realize that Jesus understands and has compassion on us. Thanks for the tip on Sibella Giorello...I'll be looking for her books - they sound interesting. How lovely to have someone give you a good report on your son. It is alwaysgood to hear that others see how wonderful our children are.